This long-established surname derives from "Ad(e)", a pet form of the Hebrew given name Adam, meaning "red-earth" (possibly referring to the earth from which God formed the first man in the Old Testament), plus the Olde English pre 7th Century diminutive suffix "-kin". The "d" of "Ad(e)" was sharpened to "t" in certain areas as a result of dialectal influences, and the final "s" indicated the genitive, being a reduced form of "son of". One Adekin filius Turst was noted in the 1191 Pipe Rolls of Norfolk, and a John Adekyn appears in Records of the Estates of Crowland Abbey, Cambridgeshire, dated 1296. The patronymic development since 1327 (below) has included: John Adekynes (Warwickshire, 1332); Willelmus Adkynson (the Poll Tax Returns of Howdenshire, 1379); and Johannes Attekyson (Yorkshire, 1379). In the modern idiom the patronymic forms of the name range from Adkins, Atkins and Attkins, to Adkinson, Atkinson and Adkisson. On October 4th 1657, George, son of George and Susanna Adkins, was christened at St. Bride's, Fleet Street, London. Robert Adkins, noted in the "Dictionary of National Biography", was chaplain to Cromwell. 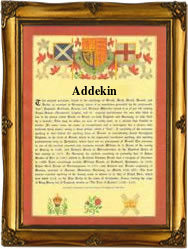 A Coat of Arms granted to the Adkins family is an ermine shield with two azure lions rampant in chief, the Crest being a red lion rampant supporting a flagstaff and ropes proper, thereon a silver flag charged with a red cross. The first recorded spelling of the family name is shown to be that of William Atkyns, which was dated 1327, in the "Subsidy Rolls of Worcestershire", during the reign of King Edward 11, known as "Edward of Caernafon", 1307 - 1327. Surnames became necessary when governments introduced personal taxation. In England this was known as Poll Tax. Throughout the centuries, surnames in every country have continued to "develop" often leading to astonishing variants of the original spelling.